I couldn’t wait to sit down and start watching Peter Bogdanovich’s Directed by John Ford, mostly because I knew it would feature clips from some of the legendary director’s finest films. Sure enough, the first excerpt that appears in the movie is the extraordinary opening scene from The Searchers, where the camera glides through a door into the vast expanse of Monument Valley, revealing a lone horseman (who, it turns out, is John Wayne) on the horizon, riding towards us. As introductory shots go, you’d be hard-pressed to find a more beautiful one than this, so right of the bat, Directed by John Ford had me giddy as a schoolboy. Originally produced it in 1971, Bogdanovich, who was unhappy with his initial cut of Directed by John Ford, went back to the drawing board in 2006, re-editing some of the initial interviews he conducted for this documentary (with stars like John Wayne, Henry Fonda, and Jimmy Stewart) and adding newer material, including insights from other filmmakers (Clint Eastwood, Martin Scorsese, Steven Spielberg, Walter Hill) who were influenced by Ford, as well as additional footage that shed light on the man’s personal life (a tape recording made by Ford’s grandson, in which the filmmaker, near the end of his life, chatted with former flame Katherine Hepburn is especially enlightening). With clips from a few dozen Ford pictures (including the silent westerns he made with Harry Carey) and several sequences narrated by Orson Welles, Directed by John Ford is 110 minutes of pure cinematic gold. Some of the best scenes in Directed by John Ford are those that reveal just how cantankerous this old filmmaker could be at times. James Stewart recalls how, one day on the set of The Man Who Shot Liberty Valance, Ford went out of his way to embarrass him in front of the entire crew, something John Wayne also experienced while making Stagecoach in 1939. Even Spielberg, who chatted with Ford for a minute or two when he was 15 years old, remembers a gruff, no nonsense man who shared only a single nugget of his vast filmmaking experience (a pretty good piece of advice, actually, pertaining to the placement of the horizon within the frame). Best of all, though, is the interview Bogdanovich himself conducted with Ford in Monument Valley, during which the great director offered terse, one-word answers or dismissed the questions entirely (When Bogdanovich asked him how he shot an elaborate scene in 1926’s 3 Bad Men, Ford replied “Wth a camera”). Aside from exploring its subject’s belligerent side, Directed by John Ford also provides insight into the man’s artistry, how he preferred images over the spoken word (James Stewart remembers him tearing entire pages of dialogue from the script for The Man Who Shot Liberty Valance), as well as his penchant for spirituality (one scene in particular features moments from, among others, My Darling Clementine and She Wore a Yellow Ribbon, in which characters carry on graveside conversations with departed loved ones). My favorite sequence in Directed by John Ford shows how, using the director’s impressive filmography, you can trace hundreds of years of American history through his movies, from the Revolution (Drums Along the Mohawk) and the Civil War (The Horse Soldiers) to Western expansion (The Man Who Shot Liberty Valance) and World War II (They Were Expendable). While Ford did, on occasion, make pictures set in foreign lands (The Informant, How Green Was My Valley, The Quiet Man), the majority of his output focused on the American experience, especially that of the Old West, with which his name would become synonymous. 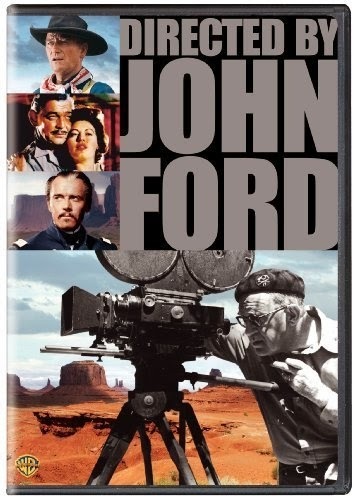 Directed by John Ford brings everything about this talented man together in one place, and after viewing it, odds are you’ll want to seek out any John Ford movies you haven’t yet seen and watch them immediately.